ONEROA HOLIDAY HOME WITH SEA andamp; BUSH VIEWS!! A perfect place for a romantic idyll for you, your family and friends. A peaceful, private central location for your Waiheke Island holiday. It is walking distance to Oneroa, Little Oneroa, Blackpool and Surfdale beaches. It is a mere 15 minute walk to Oneroa village. You can walk to over ten cafes, bars and restaurants without having to drink and drive, along with two premiere wineries Mudbrick and Cable Bay via a beautiful track. It is the perfect retreat to hang out, watch the native birds and recharge your energy. You can see the Hauraki gulf and Blackpool bay from the deck. The bush provides privacy across the valley. There are walking tracks nearby including one at the rear of the property leading to Blackpool beach. A fully equipped kitchen and an accommodating open plan layout allows for entertaining or simple relaxation in a modern style home. There is a new luxurious super king bed in the master bedroom and bunk beds with queen/king single beds in the two bedrooms on the ground floor. There is also a double pullout couch in the garage. We have a phil and teds portable cot for your usage. Please let us know ahead of time what sleeping arrangements you will need. We do charge a $50 per person per nite fee if there are over six guests. We hire beautiful linens for your stay and charge a $20 linen fee per person per stay. If you would like one nite only, please make an enquiry. We have glass ballistrades installed around the deck and the views are spectacular. The house has just been freshly painted and we have new carpets and blinds all throughout the house. We have also installed mosquito screens! It is a five minute taxi ride from the Matiatia Ferry Terminal. Fullers offers ferries every 30 minutes throughout the summer from Auckland ferry terminal. The ferry takes about 35 minutes each way. Sealink also offers a car ferry service that takes 45-60 minutes from Auckland or Half Moon Bay. Water is precious on the island. Please use it sparingly. We don't run the water when we are brushing our teeth. We use the dishwasher to conserve water. We also don't take long showers. Please don't put anything besides toilet paper, such as wipes and women feminine products down the toilet. Be careful not to let anything go down the kitchen drain such as food and coffee grinds. We abide by the saying if its yellow keep it mellow...if its brown flush it down! We require a $500 bond. toilet, tub, shower, large bathroom on ground floor next to both bedrooms. large extendable American oak table sits up to 8 people. Immaculate and spacious home. Pics don't do it justice. Really enjoyed our stay. The house was spacious and very tidy and clean when we arrived. Stayed 2 nights, one with just my partner and I which was very relaxing. The second night we had a few friends with us and the house slept 8 of us very comfortably. The outdoor area with comfy outdoor seating was a really nice place to chill out any time of the day and enjoy the sun. Being walking distance to the beach and shops was handy as well. Angela was very accommodating and super easy to deal with making the stay fuss free and adding guests late minute wasn't a problem. Definitely recommend staying! Great house, beautiful kitchen and lounge area which opens out onto a big deck that’s basically in the canopy. 5 mins walk from little oneroa beach and amenities like cafés and shops aren’t much further. Thank you for staying at our house and leaving us such a nice review. We hope you come back again. Location was fantastic and the property was wonderful. Thank you for your kind review. 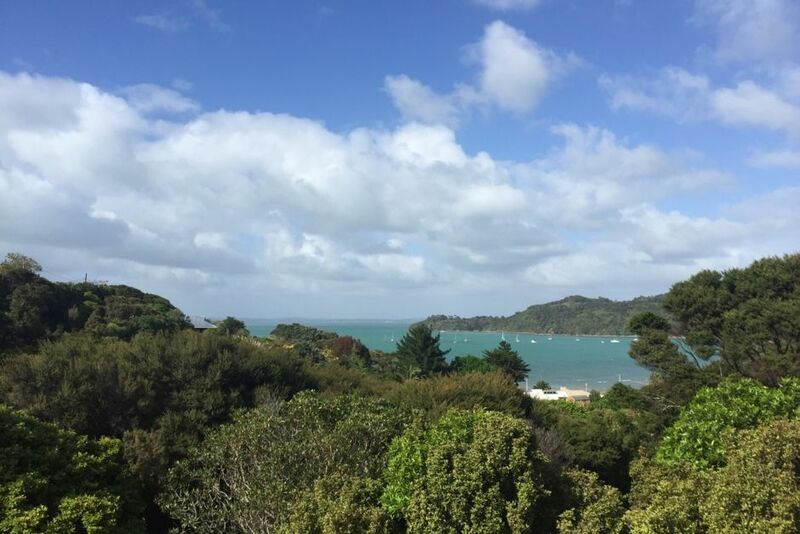 We are happy that you and your family enjoyed your time on Waiheke! The property was tired and the kitchen very dirty. The property was tired and the kitchen very dirty. It was comfortable for our stay but we thought that the state of the kitchen and appliances etc did not warrant the cost of the rental. We were asked to remove our shoes at the front door but the wooden flooring was in a terrible state of repair and needed a good sand and polish so we didn’t know why we had to remove our shoes. The courtyard and surrounding garden was very messy and run down. We could walk to Oneroa but took around 20 mins. Thank you for your kind review. We hope to see you back real soon.